A working seaside croft in the tiny township of Melvaig, some nine miles from the bustling seaside village of Gairloch in Wester Ross. Owners Fran & Chris extend a warm welcome to their self catering eco Lodge and cosy Shepherds Hut along with farm gate point of sale selling free range eggs, home produced pork and fresh, locally grown produce (in season). 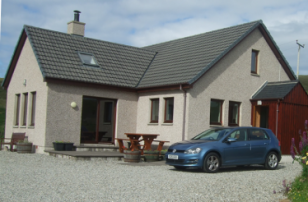 Melvaig is the last habitation on the road from Gairloch out to Rubha Reidh Lighthouse and headland. 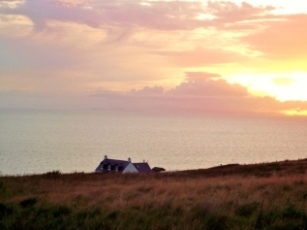 The quiet Township is home to a scattering of working crofts, local homes & holiday houses. 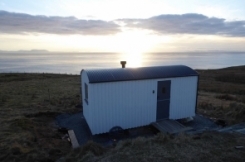 The nearest eatery is The Barn at Big Sands Camp site six miles from Melvaig but a delicious three course set dinner (£18pp) from the Fionncroft kitchen can be booked for residents of the Cottage B&B or Shepherds Hut. 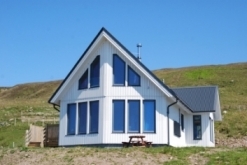 Take a trip out to Rubha Reidh, walk the three mile cliff top road from Melvaig or drive out parking at one of the signed car parking areas at the end of the road. The road is a Public Right of Passage, is narrow and privately maintained. 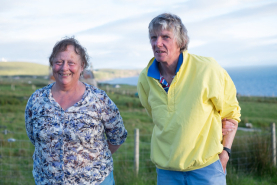 View the lighthouse and take the spectacular walk along the north headland from the lighthouse to Camus Mhor and Lochan Druing, home to white tailed eagles! Beachcombing along the shore in Melvaig can prove fascinating or just sit staring out over the Minch to Skye and The Outer Hebrides. For those wanting to get on the water there is a slipway in Melvaig for launching. When the weather allows the sunsets are spectacular and you may even catch sight of a passing whale, dolphin, or even an otter playing in the shallows. Gairloch is a large village with a bank,golf course, boat trips, shops, restaurants and hotels, a museum, leisure centre and health centre. 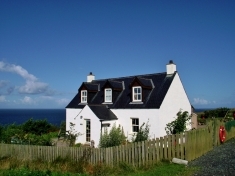 Poolewe, three miles beyond Gairloch has a swimming pool and is home to the famous Inverewe Gardens.